“Kim Kelly is My Friend” is the best TV episode about bullying I have ever seen. It doesn’t go for the easy answers, it never tries to whitewash or simplify the harsh realities of the situation, and it is, therefore, a spectacularly awkward piece of television, so uncomfortable and horrifying at times that even when certain moments are played for laughs, my jaw didn’t quite know how best to contort itself. This is not an easily digestible story, and its frightening presentation of a broken home and the titular character’s deep-seated emotional damage was far, far ahead of its time back in 1999. Hell, it’s still ahead of its time, all these years later. 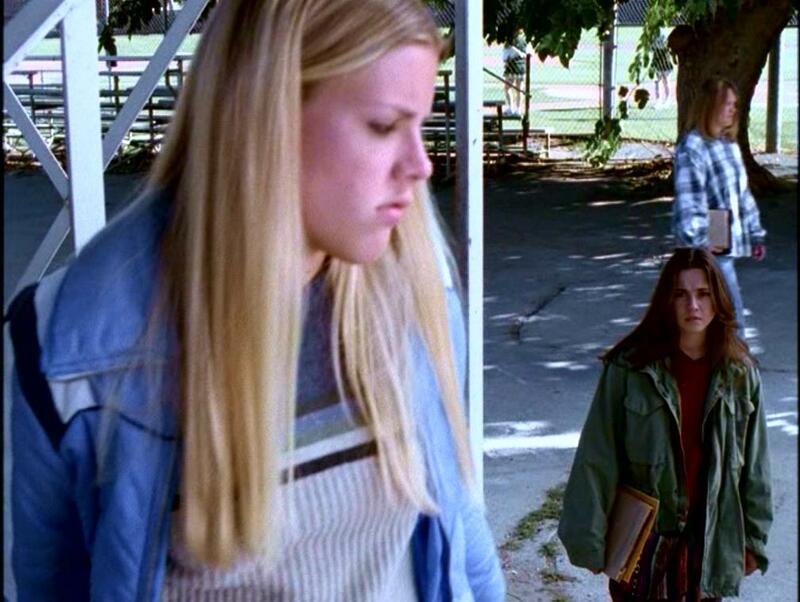 For those reasons and more, NBC hated this episode when Freaks and Geeks made its original run on the network. In creator Paul Feig’s polite words (from the DVD guide), “it was considered to be a bit too harsh compared with the other episodes…” However you want to phrase it, NBC refused to air “Kim Kelly is My Friend,” and even though the hour is absolutely crucial in developing the characters and their relationships, it didn’t see the light of day until long after the series was cancelled. I can understand why a network would be afraid of this episode. That doesn’t justify their decision, but I can at least see the reactionary reasoning behind it. The same thing could be said of Kim Kelly by the episode’s end. The hour doesn’t try to absolve Kim of her sins – because there’s very, very little that excuses the way she treats Sam – but we do gain an insightful and poignant understanding of why she is the way she is. But here’s where the NBC allegory breaks down, and also where the true genius of “Kim Kelly is My Friend” lies: we also feel genuinely sorry for Kim. Throughout the hour, we experience real, palpable emotions for a character who previously seemed to have only one, bitchy note, and we want her to one day have a better, healthier life. Kim Kelly is a bully. There’s no other word for it. In the first three episodes, we’ve seen her act cruel and vindictive towards Lindsay at almost every turn, and if anything, she’s only become more unpleasant the closer Lindsay gets to Daniel and Nick. Kim’s behavior towards Sam has been even more aggressive, from the psychological torment she laid down on him in the pilot to egging him in last week’s episode to encouraging fellow bully Karen to graffiti Sam’s locker in this hour. She’s a bully, and because Lindsay and Sam are our main characters, we’ve seen, first-hand, what effect she has on her victims. Kim’s spiteful nature has been established so well by now that this episode doesn’t need to waste one expository second getting Lindsay to a breaking point. After Kim’s latest jab, Lindsay gets fed-up, almost on the verge of tears, and Nick, seeing how much Kim’s behavior has hurt Lindsay, is just as frustrated. Nick decides to say something to Kim, and later that day, Kim suddenly starts being nice to Lindsay, inviting her over for dinner and everything. Lindsay is, of course, wary, as is the viewer, but ultimately acquiesces. This is, I think, our first sign that there’s more to Kim than meets the eye. Yes, we will learn later in the episode that Kim’s primary motivation for inviting Lindsay to her house was a selfish one, a desperate attempt to gain parental approval by showing off Lindsay as her smart, responsible, wealthy classmate, but I think that deep down, Kim really isn’t aware of how badly she treats Lindsay. When Kim starts being nice, there’s something genuine about it; it’s not just an act. Part of her probably wants to make up for hurting Lindsay’s feelings, because while she resents Lindsay, I don’t think she hates her. Lindsay clearly senses something authentic as well; otherwise, she certainly wouldn’t agree to visit Kim’s house, and she wouldn’t stick up for Kim when Sam justifiably chews Lindsay out for being ‘friends’ with his nemesis. But as I said, Kim’s primary goal here is to manipulate Lindsay, and she doesn’t even reveal her plan until they are in her driveway, about to enter the house: Kim’s parents apparently hate all her ‘loser’ friends and want to sell her car, and Kim thinks that if she can bring one respectable person to dinner, she’ll gain back some trust. Lindsay doesn’t know what to make of this, and neither does the viewer, except to think that Kim was probably lying all along. That, coupled with the grandeur of the lies Kim wants Lindsay to assist her in selling, like Lindsay’s fake beach house in Benton Harbor, imply that the scene we’re about to watch will be a comedic little demonstration of Kim’s deceitful nature. What follows is anything but. The sequence at Kim’s house is, I’m guessing, the reason NBC refused to air this episode. 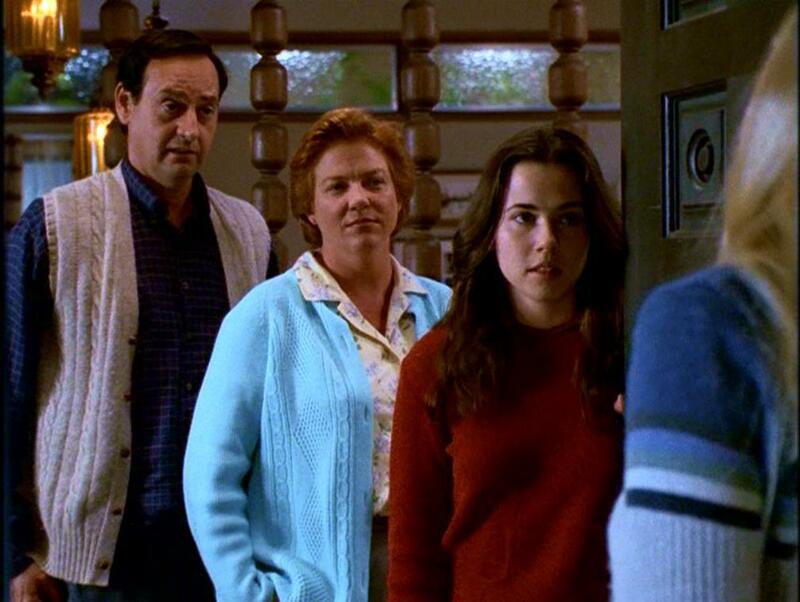 It is horrifyingly uncomfortable, at times hard to watch, but it’s also the crucial centerpiece of the hour and, I think, the most powerful scene Freaks and Geeks had done up to that point. The show’s depiction of Kim’s broken family life is brutally honest and uncompromisingly awkward. She has an illiterate and most likely abusive step-father, her mother is hostile and demeaning, the house has many plastic walls that have probably been there for a long time, dinner consists of fast food fried chicken, and her deadbeat brother lays on the couch all day in a haze (if networks weren’t so strict in 1999, I’m sure the brother would be depicted as a drug addict; as it stands, that’s the implication I get). 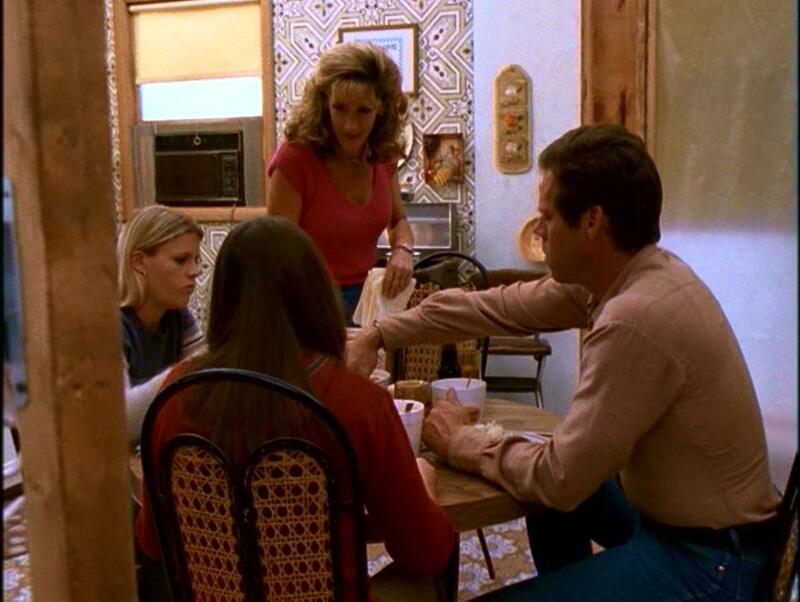 During the dinner, Kim’s mother cuts right through Kim and Lindsay’s lies, returns to verbally abusing her daughter, and the scene quickly explodes into a loud and scary shouting match that seems to be an all-too-common occurrence. Suddenly, we’re empathizing with Kim in a big way. 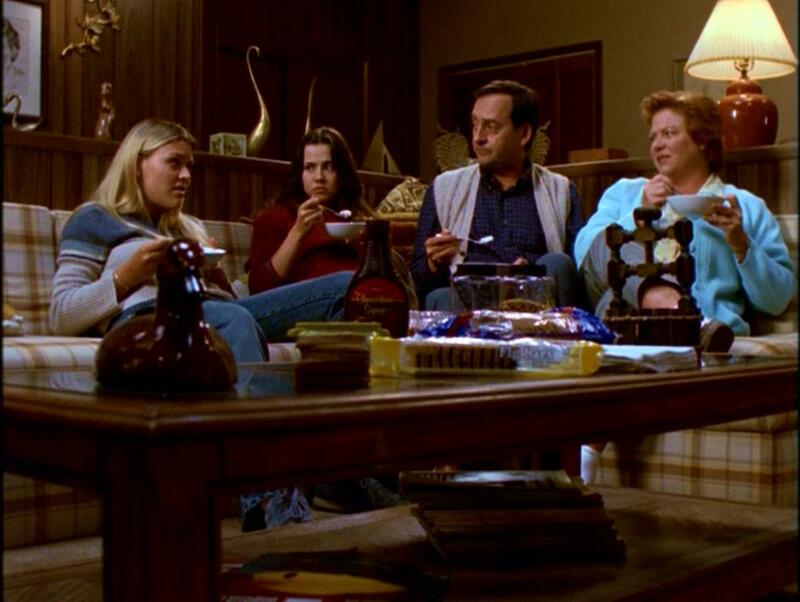 I for one could barely stomach the five minutes with this family we’re shown in the episode; imagine having to live like that all the time, day-in and day-out. It’s no wonder Kim tried using Lindsay to cool things down. All of a sudden, writer Mike White has cut to the heart of who Kim is and, in a broader sense, where bullying comes from. Kim’s mother has clearly been beaten down by life, and so she beats Kim down as a thinly veiled coping mechanism. Kim, in return, beats kids like Sam down at school, and here’s the kicker: Sam starts doing the same thing to his best friend, Neal. This is probably the thematic masterstroke of the hour, as intercut with the sequence at Kim’s house, Sam starts taking out his anger on Neal while they and Bill are hanging out in Sam’s room. With Bill stuck in the middle, Sam starts picking on Neal for being a ‘geek,’ much in the same way Kim and Karen have done to him, and when Neal starts firing insults back, they wind up in a fist-fight. Though Kim isn’t present or even mentioned in this scene, Sam’s behavior is one of the key plot points that allows us to sympathize with her. If Sam, nice, sweet, lovable young Sam can start bullying his friend, then anyone could, eventually, turn out like Kim. What Sam experiences in this one instance is something Kim goes through on a daily basis: being picked on and beat down until you feel so bad that your only catharsis comes in bringing others down with you. It’s the basic principle we’re always told about bullies, that they just feel bad on the inside, but most stories never actually go to these lengths to prove or justify that idea. Most of the time, that excuse is a throwaway, easy little answer, but not for Freaks and Geeks, and that’s what makes me love this episode. Let’s return to the scene at Kim’s house for a moment. It climaxes in the most awkward and terrifying way possible, with Kim and Lindsay literally running away from Kim’s parents. Lindsay, cipher for the audience throughout the hour, looks just as horrified as we feel. The thing is, the scene is so ridiculous and unbelievable that I could laugh if I wasn’t so thoroughly unsettled. The musical score even tries to imply a lighter, more comedic atmosphere, and I wonder if the music is therefore out of place. If all we had were diegetic sound, this would undoubtedly be a straight dramatic scene, and an effectively harsh one at that (right before Kim escapes, her mother yells at her to never come back). I’m inclined to think that the music was added to appease NBC and lighten the mood, since NBC was still operating under the assumption that Freaks and Geeks was a comedy, rather than an advanced multi-genre hybrid. If anything, the music only makes the scene more awkward. We’re being cued to laugh, but the implications of the imagery are too dark for smiles, and this just throws our emotions into even greater confusion and turmoil. The dissonance is, I think, effective in building the uncomfortable mood, but I can see how it would have thrown NBC even further for a loop. Busy Phillips, it should be noted, is absolutely fantastic throughout all of this, drawing layer upon layer of humanity and sympathy out of Kim. After Kim and Lindsay leave the house, they drive by the park only to see Daniel philandering with Karen, and this leads to Phillips’ best scene, as an overwhelmed Kim tearfully lays her soul bare to Lindsay. What Phillips nails is that deep down, Kim is a normal, hormonal teenager who, like everyone else, blows things way out of proportion. Kim actually has things to be angry or sad about, though, and this heightens the magnitude of her emotional outbursts. In the grand scheme of things, Daniel cheating isn’t Kim’s biggest problem, but he’s the only relatively stable element of her life, and having that rug pulled out from under her at this particularly tumultuous moment is understandably traumatic. 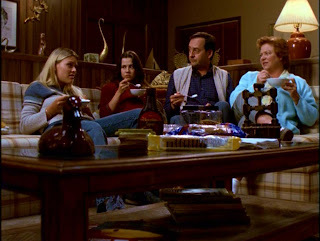 And so we enter the last, genius act of the episode, as Kim comes over to Lindsay’s house, throwing the Weirs into confusion, and then Nick follows, trying to get Kim to forgive Daniel while also trying to put the moves on Lindsay, and the Weir parents are further befuddled, and then Daniel sneaks in the back door, and Kim begins shouting at and hitting him, and the Weirs continue to have no idea what to make of these strange, strange people Lindsay has invited into their home. I would call this one of the show’s greatest comedic set pieces, except this portion too is as challenging and awkward as it is funny. I still had no idea quite how to react. It’s a crucial part of Kim’s story, as before Daniel arrives, we see that she can be calm and polite and functional under ideal circumstances. The beautiful Weir household and the nice dinner Jean prepares stands in stark contrast to Kim’s home, and for a few minutes, Kim is allowed to grieve in a healthy environment. Once Nick and Daniel show up, things take a more overtly comedic turn, but it’s still hard to laugh at Kim slapping Daniel while he slowly but surely talks her down. I felt just like the Weir family, confused and a little bit frightened at what I was watching. In the middle of all this, we get a great scene between Kim and Sam, as she hides out in his room after Nick arrives. Sam is understandably furious to have her around, and finally stands up for himself. The two wind up hashing things out over their mutual hatred of Karen, though both are so caught up in their own emotions that they barely hear or comprehend what the other is saying. Their exchange does lead to one of the biggest laughs of the episode: as Kim describes all the violent ways she’s going to hurt Karen, Sam reverts to his normal, kind persona and says “Well don’t hurt her too bad.” John Francis Daley’s delivery of that line just kills me. Finally, Daniel and Kim make up, and as Kim leaves, she seems healthier and happier than we’ve ever seen her before. Lindsay’s parents, of course, still can’t understand what’s just happened, but Lindsay herself seems to have at least a loose grasp of her crazy day. I know, because I think I felt the same way Lindsay did: like we’d been run over by an emotional steamroller, no idea of what to make of things or even how to feel, with the only bit of clarity being an unexpectedly deep understanding of and sympathy for Kim Kelly. 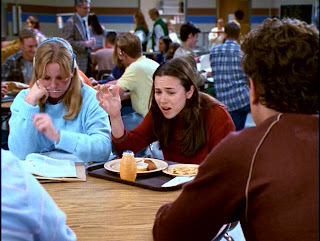 If Freaks and Geeks were to dissect the nature of bullying with anything less than confusion and emotional turmoil, the story simply wouldn’t ring true. These things only make strict, orderly sense in fiction. “Kim Kelly is My Friend” taps into the fundamental instabilities of real life, and is, therefore, the most honest and well-rounded depiction of bullying I’ve ever seen on TV. --Karen is played by Rashida Jones, who between roles in The Office, Parks and Recreation, and the film “I Love You, Man,” has established herself as one of the best straight-women in Hollywood. She can ground silly comedy quite well while still managing to be funny herself. Her Freaks and Geeks part is quite a bit different, as Karen is an all out tyrant, far scarier than Kim Kelly on her worst day. But one of the subtle implications of this episode is that Karen, like Kim, must be vulnerable and human beneath her icy exterior. If Kim’s life is as bad as it is, Karen’s must be even worse. --This episode was written by Mike White, who would go on to write comedies such as “Orange County,” “School of Rock,” and the recent HBO TV series Enlightened. It was directed by Lesli Linka Glatter, one of the best TV directors in the business. I’m most familiar with her work on Mad Men, as she’s helmed some of my favorite episodes of my current favorite TV drama. --Mr. Kowcevsky is once again seen to be a giant prick, as he punishes Sam for someone else vandalizing his locker. I wish I could say that this didn’t feel familiar, that this moment was a lazy plot contrivance, but I can’t. I’ve seen stuff like that happen. I’ve known Kowchevsky’s in my high-school career. Sigh. --John Francis Daley is wonderful in this episode, beginning to end, from his adorable insistence on eating carbs to get bigger to his very honest anger over Karen’s bullying and Lindsay’s friendship with Kim. --The funniest moment of the hour, and for me at least, of Freaks and Geeks so far, is Nick’s politely nervous request to have a Fruit Rollup. Jason Segel is so damn funny in that moment, and later, when he takes five or six more. That feels like one of the earliest defining moments of Segel’s career, an indication that few can do goofy humor quite as well as him. Episode 5, "Tests and Breasts,"
My favorite episode so far, and a review wherein I compare Freaks and Geeks to Breaking Bad.